The triumphant Lady Eagles show off their state championship medals and trophy as press photographers take turns to take their group picture. Photograph by Deren Oshiro. 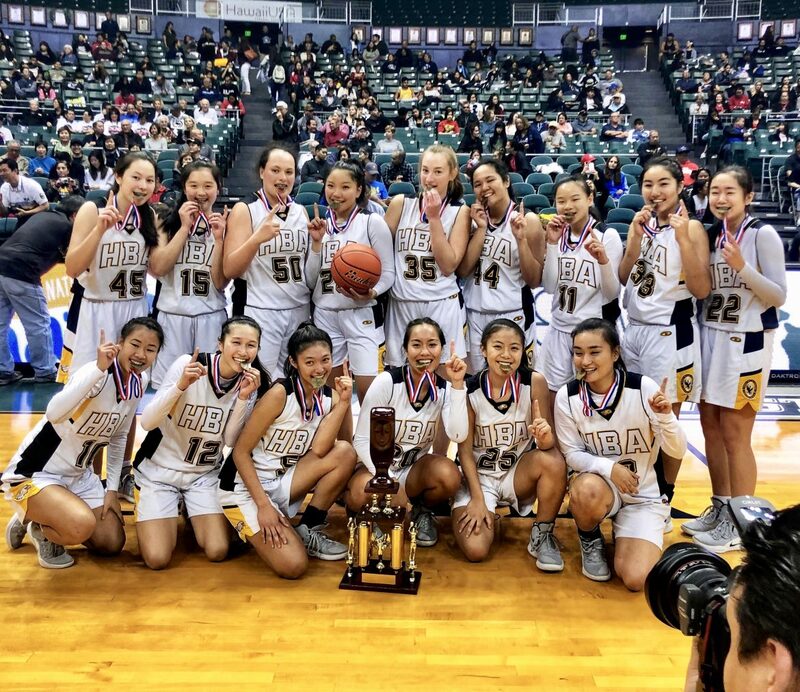 The Lady Eagles triumphed over the Seabury Hall Spartans for a 43–39 win on Saturday, Feb. 9 at the HHSAA Division II Girls Basketball State Championships. This is only the second time that the Lady Eagles have won the title, with the first win coming in 2016. Veterans Caitlin Ching (‘19), Alexis Dang (‘20), Kyley Nakagawa (‘19), and Sasha Phillip (‘20) anchored the HBA team with their experience. Freshman Hayley Taka (‘22) rounded out the starting five and Kalena Montgomery (‘19) proved to be a valuable sixth woman. Despite it being a championship game, the players say they didn’t experience any additional nerves. “Surprisingly, the championship game wasn’t the most nerve-racking for me,” Dang said. “[The two prior games] made me more nervous because we were done if we lost a game. So since we had made it to the championship, all we had to do was play like how we had the whole season, and we would be fine.” Senior Nakagawa relied on her experience to keep calm. “I wasn’t that nervous because I had the chance to experience what a championship game felt like during my freshman year. This was my last game and it was for the trophy, so I was really motivated to win,” she said. From tip-off the Lady Eagles set a furious pace, racking up a 6–0 lead early in the first quarter. Yamaguchi said that pace is a trademark of the team: “We’ve played with [high] pace all season…it’s the identity that we have as a team.” The speed and pace of the Lady Eagles would prove to be the deciding factor of the night. The second quarter saw no change of pace, with the Lady Eagles coming out quickly with a three-pointer from Dang. The Spartans would continue to pressure the Lady Eagles, preventing the latter from scoring in the paint and limiting their smaller opponents to only a one-point lead at the half. 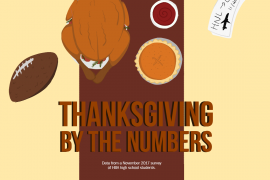 Despite the high pace, the second quarter saw a somewhat significant drop in offense, with both teams’ defenders shutting down the other’s scorers. After the half, both teams seemed invigorated, increasing offensive output and compensating for the last quarter. The Lady Eagles would ride out the third quarter with a small two-point lead. In the fourth quarter, the Lady Eagles managed a five-point run to put themselves seven points ahead of the Spartans. But, the Spartans matched their pace, eventually cutting down the lead to just two. Then Nakagawa was sent to the line and sunk one of her free throws to put the Eagles up 42–39. The Spartans looked to inbound the ball and hopefully score a three to send the game into overtime. But in a display of incredible court vision, Dang snatched the ball from the Spartans, essentially securing both the win and “Play of the Game” honors. After the game, along with Nakagawa’s Division II All-Tournament Team award, Dang was named “Most Outstanding Player” of the tournament. Taka also received recognition for being the “Impact Player of the Game.” The Lady Eagles also filled up the 2019 ILH Division II All-Stars list, with Dang’s “Most Valuable Player” award, Nakagawa’s first team nomination, Phillip’s second team nomination, and Ching’s and Taka’s honorable mentions.